A brilliant send-up of our contemporary culture from Sam Lipsyte, the critically acclaimed author of Home Land, centered around an unwitting mindfulness guru and the phenomenon he initiates. In an America convulsed by political upheaval, cultural discord, environmental collapse, and spiritual confusion, many folks are searching for peace, salvation, and—perhaps most immediately—just a little damn focus. Enter Hark Morner, an unwitting guru whose technique of “Mental Archery”—a combination of mindfulness, mythology, fake history, yoga, and, well, archery—is set to captivate the masses and raise him to near-messiah status. It’s a role he never asked for, and one he is woefully underprepared to take on. But his inner-circle of modern pilgrims have other plans, as do some suddenly powerful fringe players, including a renegade Ivy League ethicist, a gentle Swedish kidnapper, a crossbow-hunting veteran of jungle drug wars, a social media tycoon with an empire on the skids, and a mysteriously influential (but undeniably slimy) catfish. 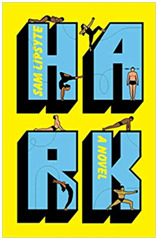 In this social satire of the highest order, Sam Lipsyte, the New York Times bestseller and master of the form, reaches new peaks of daring in a novel that revels in contemporary absurdity and the wild poetry of everyday language while exploring the emotional truths of his characters. Hark is a smart, incisive look at men, women, and children seeking meaning and dignity in a chaotic, ridiculous, and often dangerous world. Sam Lipsyte is the author of the story collections Venus Drive (named one of the top twenty-five books of its year by the Voice Literary Supplement) and The Fun Parts and four novels: Hark, The Ask, The Subject Steve, and Home Land, which was a New York Times Notable Book and received the first annual Believer Book Award. He is also the recipient of a Guggenheim fellowship. He lives in New York City and teaches at Columbia University.